Your cat is a cherished family member, and the loss of your cat can leave you feeling completely devastated. Although time and a fresh perspective will be the most effective aids to your recovery, many cat owners have discovered their own helpful methods regarding how to get the loss of their beloved cat. Sometimes losing a pet can function like a bad breakup. Individuals who have just gone through a painful breakup or divorce can shut down emotionally and find themselves locked in a depression. A large number of these people only recover from depression by finding a new love. 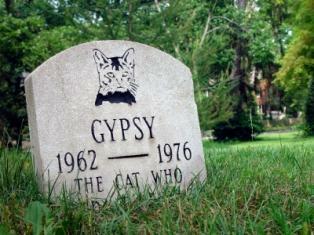 Likewise, many pet owners get over their cat-death grief by purchasing a new cat. In fact, running down to the local shelter to pick up a new kitten or cat will not only give you a new pet to cherish, but it will also spare this poor animal from being euthanized later. The hope and altruism packed into this process may lift you out of your depression. If you aren't ready for a new cat, donate your cat supplies to a local animal shelter or cat rescue. All of your cat's old toys and accessories will be put to good use. You won't find yourself staring halfheartedly at your cat's felt mouse while wondering whether or not it is time to throw everything away. Peruse pet loss forums in search of a support group. In fact, many large cities may actually have legitimate support groups for individuals with deceased pet grief. Pet-Loss.net provides viewers with a list of online resources and phone numbers that can help a bereaved pet owner toward recovery. Talking with others who have experienced similar loss may help you acknowledge and accept the present conditions. Moreover, if you are one of the individuals who receives the "It's just a cat!" comments, a support group can be vital. Regardless of how your pet died, or the significance of your cat within the home, the most important element of recovery will be time. If you have only recently lost your cat, you must try to remember that the way you feel currently should mitigate over the next few months. Should your symptoms of mourning not dissipate over the course of a few months, you may have a legitimate reason to seek therapy or counseling to learn why your psyche is having such a difficult time adapting. Rest assured, grief is normal. However, grief that persists or worsens over time and renders you psychologically defunct is not a healthy situation. Recognize your loss is real and get professional help.